Herpestids, felids, and pteropodids—all exhibit positive correlations between orbital convergence and skull size (also procyonids and tupaiids - Table 3). 6 To eliminate the chance that an enlarged masticatory complex in folivorous didelphimorphs would differentially influence the position of the lower orbital margin, and thus an evaluation of variation in orbital convergence across this clade (Cartmill, 1972), no such species are included. 7 Orbital convergence species means for four cheirogaleids and two tarsiids are from Ross (1995). Means for three galagids and two lorisids are based on adult data collected by the authors or Ross (1995). Linear dimensions for all nocturnal primate faunivores were taken by the authors. Table 3. 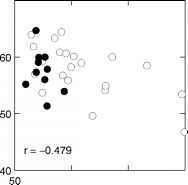 Bivariate correlations (r) for mammalian interspecific series"
b Comparisons versus other cranial measures differ little. c When restricted to only diurnal species (n = 27) and thus a single activity cycle, r= 0.556 at p<0.01. d Due to two larger-sized outlier species, pteropodids exhibit a negative correlation between orbital frontation and size. With these data excluded, the correlation is no longer significant (p>0.15). eWhen restricted to only nocturnal species (n = 8) and thus a single activity cycle, r = 0.838 at p < 0.01. -This represents the value with one large-sized outlier species eliminated from the sample (n=10). 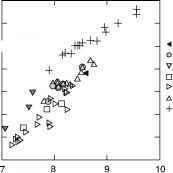 Analysis of all 11 sister taxa results in a nonsignificant correlation (r = -0.273; p > 0.15). gWhen restricted to only diurnal species (n = 4) and thus a single activity cycle, r = 0.989 at p < 0.01. Of these three clades, only larger-sized pteropodids and herpestids with greater convergence tend to have postorbital bars (Figure 7). Contrary to predictions of the NVPH (Cartmill, 1970, 1972), felids do not show a link between postorbital bar formation and orbital convergence (Noble et al., 2000; Ravosa et al., 2000a). Felids also exhibit a negative correlation between orbital frontation and skull size (also procyonids and tupaiids - Table 3), with postorbital bar formation bars tending to characterize only smaller, more frontated cats (Figure 8A). Herpestids with greater orbital frontation also tend to possess bony postorbital bars (Figure 8B). Pteropodids, however, do not exhibit this pattern (Noble et al., 2000; Ravosa et al., 2000a). In addition, size-related decreases in orbital frontation are not observed in the less-encephalized mongooses and fruit bats (cf., Figures 8B and 9). Figure 9. Brain mass(0 33) versus face size in plesiadapiforms, omomyids, adapids, tupaiids, felids, herpestids, and pteropodids (based on adult species means in Stephan and Pirlot, 1970; Stephan et al., 1981; Gittleman, 1986, 1991; Martin, 1990; Ravosa et al., 2000a). Versus the other clades, felids, and omomyids are significantly more encephalized for a given face size, thus suggesting the presence of increased basicra-nial flexion and greater frontation of the orbital apertures (Ravosa, 1991b,c, unpublished; Ross and Ravosa, 1993; Lieberman et al., 2000; Ravosa et al., 2000a,c). convergence levels than diurnal sister taxa (Figures 10 and 11; also in a later section). Interestingly, the nocturnal, more frugivorous kinkajou (Potos) has a degree of orbital convergence similar to other nocturnal procyonids (Figure 11). In similar-sized didelphimorphs, four nocturnal faunivores of the genera Philander, Chironectes, and Metachirus—all possess more convergent orbits (mean = 53.5°; range= 50.4-57.8°) than three nocturnal arboreal frugivores of the genus Caluromys (mean=42.4°; range = 42.0-43.0°) (Mann-Whitney U test among species means of 30-38 mm for the nasion-inion chord, p = 0.034). Therefore, as compared to nocturnal frugivores and diurnal faunivores, only nocturnal predators appear to display marked stereoscopic visual acuity and depth perception (cf., Allman, 1977, 1982; Cartmill, 1972, 1974, 1992). Figure 10. Orbital convergence versus face size in Eocene primates, primate sister taxa, extant primate nocturnal predators and other putative analogs (adult species means - adapted from Ravosa and Savakova, 2004). The first primates (omomyids, adapids) are similar to primate nocturnal predators (cheirogaleids, lorisids, galagids, tarsiids) and felids in exhibiting relatively higher convergence levels. The remaining mammals display more divergent orbits—tupaiids, plesiadapiforms, dermopterans, pteropodids, and herpestids. In contrast to its largely diurnal sister taxa, the herpestid nocturnal faunivore Dologale (arrow) displays a relatively greater degree of orbital convergence. These and other comparisons suggest that the derived presence of forward-facing orbits in basal primates was an adaptation for nocturnal visual predation (cf., Figure 11). Elevated convergence in diurnal adapids (cf., Cartmill, 1974; Martin, 1990) is due to the retention of basal primate (=omomyids-like) levels of convergence coupled with subsequent evolutionary increases in body size. infants exhibit less convergence than adults (Ravosa and Savakova, 2004). On the other hand, anthropoids are characterized by postnatal increases, decreases, and isometry of orbital convergence (Table 4). Not surprising, strepsirrhines exhibit a common growth pattern, whereby orbital convergence and frontation are negatively correlated, while anthropoids show isometric or positive ontogenetic relations between convergence and frontation. Therefore, it is unlikely that a single explanation can explain both positive and negative correlations between convergence and frontation during ontogeny (Table 4) or across a clade (Table 3). Figure 11. Orbital convergence versus skull size in procyonids (A) and tupaiids (B) (adult species means - adapted from Ravosa and Savakova, 2004). In the former clade, the nocturnal, highly fTugivorous kinkajou (Potos -arrow) has an average degree of orbital convergence versus other nocturnal sister taxa (A); at about the procyonid median skull size, kinkajous have the median convergence value. 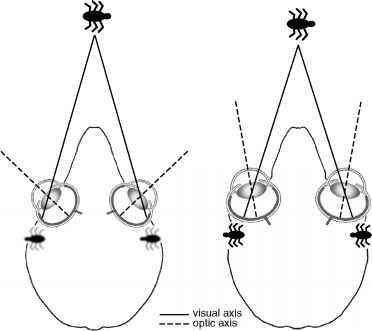 This is opposite claims that elevated convergence and stereoscopic visual acuity are related to nocturnal arboreal frugivory (Rasmussen, 1990; Sussman, 1991; Crompton, 1995). In support of the NVPH, procyonid (A) and tupaiid (B) nocturnal predators (solid circles) exhibit relatively higher convergence levels than diurnal predators and foragers (open circles). Similar to other mammals, convergence increases allometrically in these clades (Tables 3 and 4). and this difference is maintained into adulthood. In addition, anthropoid infants (except in the smaller-brained Alouatta) exhibit relatively greater frontation, and this pattern likewise characterizes suborder variation in adult levels of orbital frontation (Table 4). "Significance levels: **=p<0.001; *= p < 0.05; ns=p>0.05. bComparisons versus other cranial measures differ little.